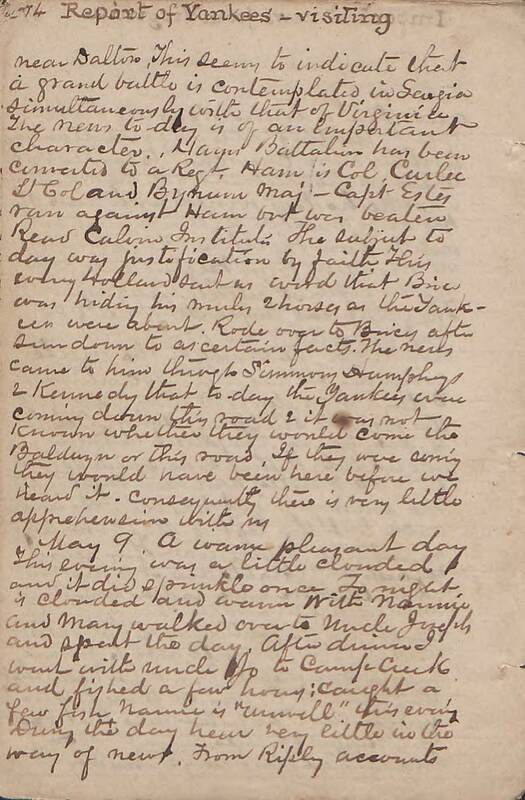 Item description: Entry, dated 8 May 1864, from the diary of Samuel Andrew Agnew. Agnew describes reports received from the Battle of Spotsylvania Courthouse in Virginia, including heavy Confederate losses. 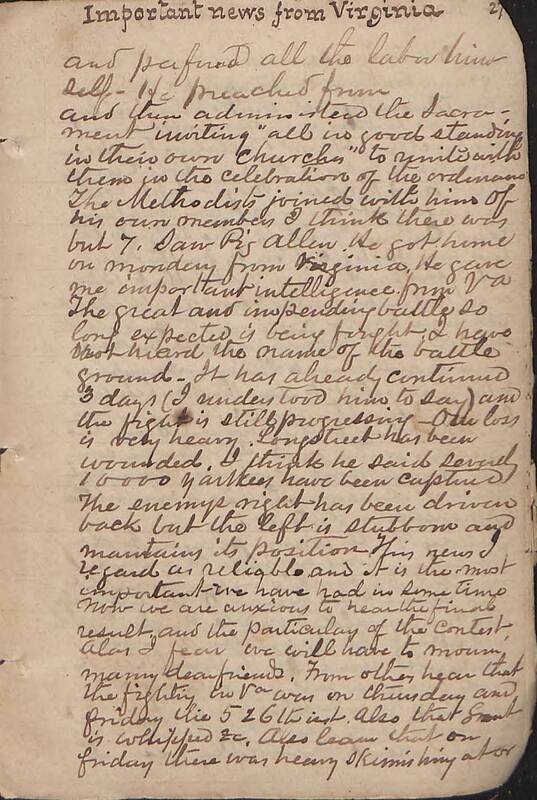 Item citation: From the Samuel A. Agnew Diary, #923, Southern Historical Collection, The Wilson Library, University of North Carolina at Chapel Hill. Sabbath. This morning was clouded and looked rainlike. Uncle Jo called in this morning. He had heard that the Yankees were in Ripley friday but his understanding was they have gone back. Rode with him down to the Presbyterian Church. This was a sacramental occasion, and a large congregation was out. Kimmons had no assistance and performed all the labor himself. He preached from and then administered the Sacrament, inviting “all in good standing in their own Churches” to unite with them in the celebration of the ordinance. The Methodists joined with him. Of his own members I think there was but 7. Saw Pig Allen. He got home on monday from Virginia. He gave me important intelligence from Va. The great and impending battle so long expected is being fought. I have not heard the name of the battleground. It has already continued 3 days (I understood him to say) and the fight is still progressing. Our loss is very heavy. Longstreet has been wounded, I think he said severely. 10000 Yankees have been captured. The enemy’s right has been driven back but the left is stubborn and maintains its position. This now I regard as reliable, and it is the most important we have had in some time. Now we are anxious to hear the final result, and the particulars of the contest. Alas I fear we will have to mourn many dear friends. From others hear that the fighting in Va. was on thursday and friday the 5 & 6th inst. Also that Grant is whipped &c. Also learn that on friday there was heavy skirmishing at or near Dalton. This seems to indicate that a grand battle is contemplated in Georgia simultaneously with that of Virginia. The news today is of an important character. Ham’s Battalion has been converted to a Reg’t. Ham is Col. Curlee Lt. Col. and Bynum Maj. Capt. Estes ran against Ham but was beaten. Read Calvin Institutes. The subject today was justification by faith. 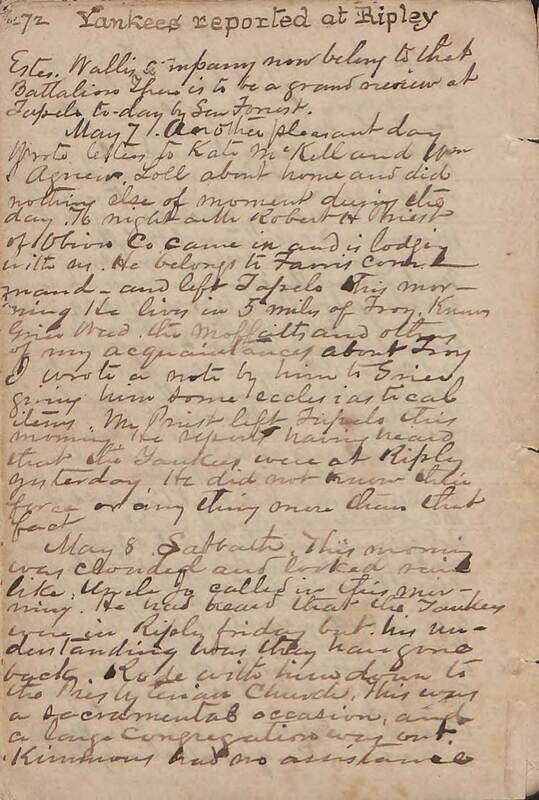 This evening Holland sent us word that Brice was hiding his mules, & horses, as the Yankees were about. Rode over to Brice’s after sundown to ascertain facts. The news came to him through Simons Humphreys & Kennedy that today the Yankees were coming down the road & it was not known whether they would come the Baldwyn or this road. If they were coming they would have been here before we heard it, consequently there is very little apprehension with us.